There are many things that contribute to a business’ success and others that can be attributed to a business’ failure. Whether you are a new business owner just starting your venture or you are a long-time business owner with many years of experience under your belt, there are probably many aspects of running a business that you have heard can add or has added to the success of your business. One such “category” for a business’ success that can make or break a business is its organization. Not only do you need organization in the office, but you also need it in the care and storage of your inventory and supplies. Felix Loeb has been supplying businesses in the Chicago area with solutions for storage and handling since 1928. 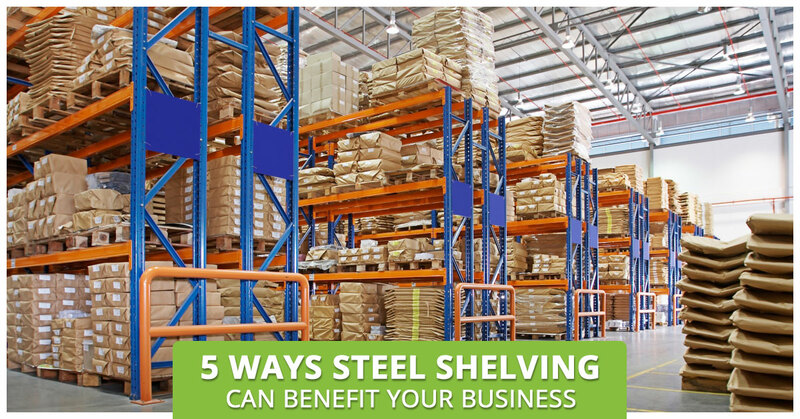 We provide many high-quality products, but today we are going to talk about the benefits of steel shelving and how vertical organization can be a contributing factor to your company’s success. Could your backroom be described as the aftermath of a catastrophic natural disaster? Or, do you struggle to have enough room to stay organized? Steel shelving is a great asset for staying organized and saving floor space. Vertical storage uses less floor space for the same amount of products, supplies or other items that you keep in your backroom; it will not only better utilize your space, but will reduce tripping and other hazards that can cause long-term problems for your employees and you, the business owner. Vertical storage can also increase business efficiency not only because your employees and yourself won’t be wasting time trying to get through the obstacle course that is your backroom, but also because you will be able to find your products or supplies more quickly than if it was stacked and stored on the floor. Time is money, so why waste time looking for products when you could devote that time to bettering your business, getting shipments out faster, or helping more customers? Shrinkage can wreak havoc on a business and ultimately be a promising business’ demise. Steel shelves, because they provide vertical organization, and generally better organization, can cut down shrinkage caused by damaged or lost goods considerably. Each item lost to shrinkage is money out of your business’ pocket. Though there will always be some amount of shrinkage, successful businesses find ways to reduce it by using quality vertical storage and steel shelving. Is your backroom a jungle of boxes? If you have video surveillance, but have stacks and stacks of boxes, your video surveillance, though still of some use, will not be utilized to its fullest potential: Steel shelving, as mentioned earlier, is a means of organization and of keeping boxes and other items typically found in the backroom off the floor so your security cameras can have a clear view of the entire room. Perhaps you are a small business seemingly bursting at the seams and in need of a new building, but at the moment, are unable to upgrade. Steel shelving organization, as mentioned, is a great way to better utilize your space. Better using your vertical space will alleviate the need for a bigger footprint. If you are a business concerned with going green, this can be another way to do that! Are you interested in investing in your company’s success through better organization means? Shop Felix Loeb steel shelving online! We offer a variety of options including open shelving, closed metal shelving, bin shelving, wire shelving, and more. We’d love to help your Chicago area business thrive. Contact us for a free project quote!